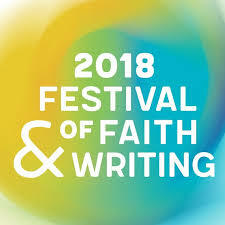 It’s time to “Make Reading Great Again” at the 2018 Festival of Faith and Writing. Every two years, the Calvin Center for Faith and Writing and the Calvin English Department host a three-day celebration of books, writing, publishing, reading, and faith. It’s a big-tent gathering of readers and writers from all over the U.S. and Canada and beyond, giddy with excitement and highly caffeinated, coming together to greet friends new and old and share the joy of literature and belief. This year the party happens April 12-14. If you are able to join us: wonderful! We’ll be thrilled to welcome you. But if not, those of us who plan this big party work hard to spread the love and create resources for all. In that spirit, I offer you a few recommendations, drawn from this year’s featured authors. No one can read everything by all our authors, so these are just a few treasures from my idiosyncratic explorations. If you live on this planet, you must read this bracing summation of what climate change means for our home. McKibben, a church-going, Sunday-school-teaching Methodist, is also one of the most persuasive and eloquent environmental writers in the world. His 1989 The End of Nature sounded an early claxon about climate change, and he has persisted as a writer, speaker, and activist ever since. Eaarth, his 2010 assessment of where we are (or were), is not good news: “the earth has changed in profound ways, ways that have already taken us out of the sweet spot where humans have so long thrived.” Hence the proposal to spell the earth’s name differently: it’s a different planet. The book is packed with research, description, and gloom. By the end of the first half, I considered instructing my children never to reproduce. What’s the point? However, the second half imagines how we might live on this changed planet. I found myself both chastened and encouraged, even energized. Life will be different, but it can still be beautiful. We need to prepare. McKibben’s more recent book (2013) might be described as a memoir of activism. It braids together two narratives: the descriptions of his work with the organization 350.org (which he helped found) alternate with meditations on the quiet pastoral work of learning beekeeping from a friend. The double narrative enacts McKibben’s conviction that while climate change certainly calls us to join forces against the global predations of the fossil fuel industry, it also calls us to the local work of healing our particular, loved places—in his case, Vermont. McKibben’s apprenticeship in beekeeping provides a curiously hopeful counterpoint to the endless discouragements of activism. Reading this book in 2018 casts the struggles recounted in the book into deeper shadow, as the current U.S. administration dismantles even meager government efforts to slow climate change. Attempts to disrupt the collusion of government and the fossil fuel industry feel as if they amount to mosquitos swarming a battleship. Of everything I’ve read for the Festival so far, this book is my favorite. Is God real? Is there more than this? What do we know about the neurophysiology of spirituality? Those are the questions this distinguished and highly experienced journalist set out to answer, and the result is a fascinating, even breathtaking narrative, incorporating Hagerty’s interviews with researchers, spiritual “virtuosos,” peyote men, survivors of near-death experiences, and a whole cast of interesting characters. Hagerty, who for decades covered the Justice Department and the religion beat for NPR, brings her cheerful curiosity and exacting care to the task. She also brings her own personal faith. Raised Christian Science, she drifted away as an adult, but a period of questing has led her to identify now as a “mainstream Christian.” Throughout the chapters of the book, Hagerty gently but persistently interrogates varieties of spiritual experience, careful to distinguish what can and can’t be known based on research. I closed the book feeling inspired to meditate more, pray with more confidence—and read the book again. But for now I still have to finish her more recent book on the science of midlife, Life Reimagined—another enjoyable and enlightening ride. This wrenching memoir might be described as “an account of moral PTSD.” Fair served in the U.S. Army and then later became a contract interrogator in Iraq. This spare and unsparing account describes not only what Fair saw but what he himself did in Iraq. Suffice to say that the Abu Ghraib horror was not an isolated aberration in the surreality of the Iraq war. Fair first wrote out about his experience in 2012 with an article in Ploughshares, which led to a long and strenuous public reckoning not only with the U.S.’s actions in Iraq but with his own terrible guilt. Fair is a lifelong Presbyterian, and he describes frankly in the memoir his attempts to hide in the spiritual shadows, unable to believe that God could forgive him. Danticat could be the most decorated fiction writer you may have never read or even heard of. National Book Award finalist (twice), McArthur Fellow, National Book Critics Circle winner: this Haitian-American novelist, memoirist, and young adult writer helps honor the stories of the Haitian diaspora. Danticat’s first novel, Breath, Eyes, Memory (1994), follows young Sophie from her home in Haiti to Brooklyn, where she reunites with her mother and begins to grapple with the demons haunting the whole line of women in her family. At first, I thought this was a novel about immigration, but as it develops it focuses more on the legacy of violence against women and the ways in which mothers and daughters can both love and damage one another. Danticat’s latest book, out this past summer, is a memoir about her mother’s death. If you are a fan of Oswald Chambers’s beloved devotional classic, My Utmost for His Highest, you will love this combination memoir/literary biography. Even if Chambers is not your jam, there’s plenty to appreciate in Halford’s account of moving from the heart of Texas evangelicalism to the rarefied world of the literary elite in New York. First attending Barnard College and then taking a job as a book reviewer at the New Yorker, Halford had to learn to code switch to keep her faith, and her faithful reading of Chambers’s famous devotional—a habit inherited from her mother and grandmother—kept her grounded. She began to wonder who Chambers was and how this book came to be, so she went on a quest to find out. Halford combines her insightful observations about contrasting American subcultures with her research into Chambers and (as it turns out) his wife and collaborator. This is all an unlikely premise for a memoir, but with all those disillusioned-and-recovering-evangelical memoirs out there, it’s refreshing to read about a person whose childhood faith simply matures and adjusts slowly and surely. The theme of reconciliation and peace-making seems to be emerging in this Festival, anchored by Parker Palmer and Carrie Newcomer presenting together in one of our plenary spots. But O’Tuama is helping to round out our offerings around that theme. A poet and theologian, O’Tuama has worked through the Corrymeela Community to create spaces for face-to-face healing and reconciliation in Northern Ireland. He has published volumes of poetry and worship resources, among other things, but I highly recommend listening to his interview with Krista Tippett on On Being. As of this writing, this title hasn’t even come out yet: the pub date is Feb. 6. However, I have a feeling Kate Bowler is going to be one of the stars at Festival. An historian of religion at Duke Divinity School, her 2013 book on the prosperity gospel in America, Blessed, received swoony reviews far beyond scholarly religious circles. Then, she gained instant national attention with her op-ed essay in the New York Times in 2016, in which she describe how it felt to be diagnosed with stage IV cancer at age 35, facing this reality with all those prosperity gospel assumptions ringing in her ears. Oh goodness, there’s so much more! Fleming Rutledge with her tour de force, The Crucifixion. Jen Hatmaker with her latest hot-seller, Of Mess and Moxie. A bevy of young religion journalists including Jonathan Merritt, Emma Green, and Sarah Pulliam-Bailey. The film producer Abigail Disney, director of The Armor of Light. Here, I’ll just send you off to more links and you can explore in your own way. To register to attend the Festival, go here. To sign up for our email newsletter, Bookkeeping, with links to great stuff from current and past featured speakers, go here. To see a full list of FFW18 speakers, panelists, and workshop leaders, go here. To consult a recommended reading list for this year’s featured speakers, go here. To subscribe to ReWrite Radio, the podcast of the Center for Faith and Writing featuring Lisa Ann Cockrel, Festival Director, go here.